This warm, spicy drink makes a delicious treat on a crisp autumn day. It only takes a couple minutes to add the ingredients to your slow cooker – and before you know it, you’ll be serving up a special treat that everyone will enjoy. As an added bonus, the welcoming aroma of warm spices will fill your kitchen, as well. 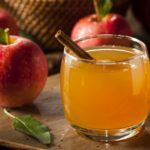 Spicy Mulled Apple Cider – This warm, spicy drink makes a delicious treat on a crisp autumn day. – Apple Cider, Orange ((washed thoroughly and sliced)), Cloves ((a small handful, whole cloves)), Cinnamon Sticks, Allspice ((ground)), Maple Syrup, Combine all ingredients in a slow cooker and stir to combine. ; Cook on lowest setting for 3-4 hours. ; Strain and serve hot. ; – Add a cinnamon stick, a wedge of apple, or a slice of orange to dress it up! This warm, spicy drink makes a delicious treat on a crisp autumn day. Cook on lowest setting for 3-4 hours. Add a cinnamon stick, a wedge of apple, or a slice of orange to dress it up!